COLUMBIA, MD – (November 28, 2018) – The Howard Hughes Corporation®, in collaboration with the Howard County Arts Council, is now accepting applications for its second annual 2019 Merriweather District Artist-in-Residence (MD AIR) program in Downtown Columbia, MD. Up to three artists will be selected from entries submitted nation-wide, and provided with a $10,000 stipend, studio space and housing to spend up to six weeks in residence, from May 13-June 24, 2019. Creating work in their chosen artistic medium, applicants will be evaluated based on their intention to produce work that reflects an innovative approach to new media and interdisciplinary arts forms. Now in its second year of an annual program, the 2019 MD AIR program is designed to nurture the creative inspiration of artists as they are invited to experience Downtown Columbia as an evolving urban center and burgeoning creative hub. The iconic Merriweather Post Pavilion is currently undergoing a $50 million renovation and expansion, adjacent to the Chrysalis amphitheater which was dedicated in 2017. Maren Hassinger, Retired Director of the Rinehart School of Sculpture, Maryland Institute College of Art. A graduate of the Maryland Institute College of the Arts and local art organizer, Hoesy Corona used his residency to advance his multi-media, site-specific installation Climate Immigrants, a project that considers the impending plight of climate-induced migration worldwide and its effects on people of color, developing a wearable sculptural series of climate ponchos. Since his residency, Corona has been accepted into the three-year fellowship at the Tulsa Artist Fellowship program in Tulsa, OK. Associate Professor of animation and interactive media at UMBC, Eric Dyer used his residency to develop Flora, a live installation piece that is a motion-portrait of Eadweard Muybridge’s wife in the form of a turntable-style zoetropic performance. Eric recently premiered Flora in Chicago, at September’s Atlas Obscura eventInto the Veil. He has been commissioned by singer-songwriter David Gray to create five new zoetrope-images for the music video for Gray’s forthcoming single. Internationally acclaimed vocalist and performance curator, Sophia Brous developed a site-specific commission for last month’s OPUS Merriweather festival in collaboration with the Annapolis Chorale led by Music Director J. Ernest Green. This past October 13, the OPUS Merriweather festival took over the Merriweather Post Pavilion, Chrysalis amphitheaters and the surrounding woodlands for an evening of art, music and technology. Almost 15,000 people experienced OPUS Merriweather’s large-scale art installations and mesmerizing musical performances, embodying The Howard Hughes Corporation’s commitment to the exploration of the creative process and the belief that arts and culture are inextricably linked to the development of its community’s identity. Brous has a range of new commissioned works currently in-development, from contemporary operas Gorgon and The Square with Nicola Gunn, to the feature film and live performance theatre event The Invisible Mountain with filmmaker/artist Ben Russell, and Glossa, a chorus for untrained voices. MD AIR applications will remain open until February 4, 2019. For further information and to apply, visit www.hocoarts.submittable.com. 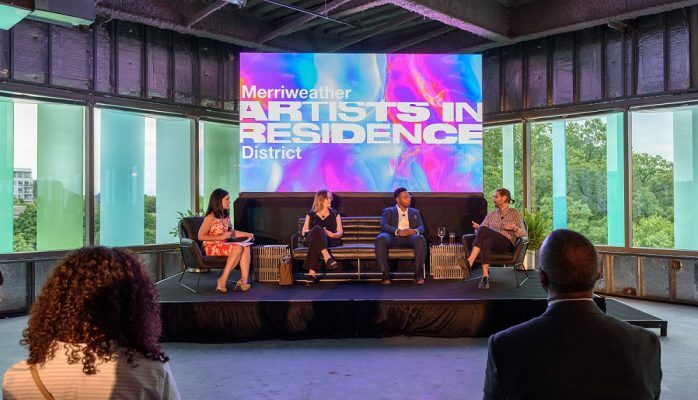 The Open Studio for the inaugural Merriweather District Artists in Residence program included a panel discussion on art and technology. The Howard Hughes Corporation is collaborating with the Howard County Arts Council to present the MD AIR program. The Howard County Arts Council is a model multi-purpose arts agency that supports a wide variety of programs and opportunities that advance artistic development in Howard County. In addition to providing expertise and advice, the Arts Council will have a representative on the artist selection panel, administer the on-line selection process and assist with MD AIR open studio activities. The Howard Hughes Corporation owns, manages and develops commercial, residential and mixed-use real estate throughout the U.S. Its award-winning assets include the country’s preeminent portfolio of master planned communities, as well as operating properties and development opportunities including: The Seaport District NYC in New York; Columbia, Maryland; The Woodlands®, The Woodlands Hills, and Bridgeland® in the Greater Houston, Texas area; Summerlin®, Las Vegas; and Ward Village® in Honolulu, Hawaiʻi. The Howard Hughes Corporation’s portfolio is strategically positioned to meet and accelerate development based on market demand, resulting in one of the strongest real estate platforms in the country. Dedicated to innovative placemaking, the company is recognized for its ongoing commitment to design excellence and to the cultural life of its communities. The Howard Hughes Corporation is traded on the New York Stock Exchange as HHC. For additional information about HHC, visit www.howardhughes.com.